The events that stay with you all your life, good or bad, cause ripples that seem wholly out of proportion to the meagre few minutes, hours, or even days that pass while they actually take place. It seems – it is – completely unfair. What gives a single ten-minute span of your life the right to exert an influence so much greater than a million others the same length? The Bradford Fire didn’t end when the last flame was extinguished. For me, it went on for an entire summer and in some ways continues to this day. Far more so, for many other people. And this is why anniversaries are perhaps least relevant to those closest to the event in question, and why I thought long and hard about whether to write this article. But I do feel my perspective might add something to the understanding of the event for people who were less close to it, or maybe not even not born at the time. In 1985 I was the editor of the City Gent, so in a sense the fire happened on my watch. More than this, my parents, Ella and Norman Fox, were making a rare excursion to Valley Parade in order to see the Third Division Championship trophy presented. I’d got them tickets for the stand, while I took up my usual place on the Kop with my friends (sporting the bantam mask I’d first worn when we clinched promotion at Cambridge… it began as that kind of day). To cut a long story short, my parents were amongst the four or five most badly injured of all the Bradford Fire survivors. Through their own efforts and those of others, they managed to get over the wall at the front of the stand and onto the Valley Parade pitch where I eventually found them, close to the Bradford End. Some of you will recall the near-full-page photo on the front of the T&A on 13 May. The elderly couple lying down in the goalmouth were my parents. I’ve lost count of how many operations each of them underwent in the weeks that followed. Skin grafts took, then failed, were redone and then took again. At any point in the first six or seven weeks either or both of them could have died. Throughout, the spirit among the staff and the patients at St Luke’s was every bit as remarkable as others have noted, the care delivered with great skill, easy humour and deep humanity. In particular, my father kept up his lifelong pursuit of looking for silver linings in the darkest clouds. But he was nobody’s fool, and recognised that the attention of the media and the attendance of the great and good had a side to it which veered closer to self-interest than sympathy. Like so many of his generation, he saw through much but said little. There are things you can change and things you can’t. She went outside and fetched him in. Of course, I was coping with guilt as well as intense worry at first. I hadn’t been hurt, and I’d been the one to suggest that my parents came along that day. But this dissipated more quickly than you might imagine, because when it came down to it guilt was a mere indulgence compared to the more pressing emotions many of us were dealing with. I make no apology for the personal nature of these recollections, because this is very much the point I want to make. Above anything else, the Bradford Fire was a series of individual, tragic and traumatic experiences. The 56 themselves, the injured, their friends and families, each went through their own private battles. Some longer than others. Everything else – the media attention, the rallying round of so many genuinely caring people, the successful Disaster Fund administration and the support of friends – all of this was, in many ways, a welcome distraction from the individual agonies that so many Bradfordians and other people were suffering. But those agonies remained. My mum and dad came through the Fire. It left them with disabilities and scars of every kind, but very little bitterness. And as my father said, burns aren’t like cancer or heart attacks. They don’t come back on their own, so in that sense he actually felt lucky – much as he did when he survived the war. Just before my parents went home, one of the senior medical staff – probably David Sharpe, I can’t quite recall – listened to my father as he explained why he thought he was lucky. He then turned to my mother. “It was bloody awful though, wasn’t it, Ella?” She readily agreed. Perspectives, all different, all valid. I can hardly imagine what it must have been like for those who lost people. It’s their experiences, their views, that all of us have to respect most of all. There are no right reactions to something like this, no inappropriate responses. Some will have been left touched by the kindness of others and the sense of unity which the Bradford Fire instilled in many of us. A few will have been unable to look beyond anger and a legitimate desire to find out what happened and why. Some have suggested that the City Gent might have got more involved in marshalling opinions about the fire, or even campaigning for fuller investigation of its causes. I think this misjudges not only the mood of the time in Bradford, but also the nature of a fanzine. More to the point, the tools of opinion-gathering differ markedly in 2015 to the resources we could command in 1985. The internet was a mere glint in the eye of a geek. Possibilities were altogether more limited at the time. Fanzines were in their infancy in 1985 and we were in the process of inventing the medium as we went along. At first I saw the City Gent as a backdoor into sports journalism, or programme editorship at least. But this quickly changed. Fanzines need to maintain a healthy distance between themselves and their respective clubs, or they will inevitably drift away from their supporters. Just as the fanzine isn’t the appropriate medium to promote the club line, it’s equally ill-equipped for serious investigative journalism. Its tone is more akin to the irreverent, ‘so-what-if-I’m-talking-crap-it’s-Saturday-afternoon’ banter of the terraces. Then there’s the simple matter of timings and resources. In the 2010s, social media and online forums ensure that opinions are quickly posted and read by all and sundry. We had a postbag – yes, snail mail, remember that? – of maybe 20 letters a month and a print run in the hundreds. We used to collate the pages by hand on my parents’ living room table and were saving up for a long arm stapler. The fanzine came out once a month. By the time a debate conducted by those means reached any conclusion we would all have been… what, about thirty years older? Finally, there’s the question of 1980s attitudes. We may all have had a moan about various directors and had our suspicions about some of their motives, but few would argue with the fact that finances were tight. At that time, ground safety simply wasn’t seen as the priority which, with hindsight, it should have been. Our club was a long way from perfect – yes, warnings had been made and ignored – but it’s hard to think we were any different from other clubs at the time. And even if some semi-mythical Ken Morrison or other kind benefactor had presented Bradford City with a substantial sum of money, many of us would have been crying out to see it spent on a decent midfielder, or a new strike partner for Bobby, rather than sorting out the stand. It’s probably not an easy thing to admit, but we’d have taken a chance on it, too. Beyond all this, few people in Bradford, myself included, would have had much stomach for recriminations. It was ultimately all about the victims, and coping with the enormity of what had happened. Many of the survivors felt the same way. The anniversary itself means different things to different people, and it does bring an opportunity to air the varying perspectives of people who were there at the time. It goes without saying that what happened shouldn’t go unmarked. There’s bound to be a wide spectrum of opinions about the fact that this anniversary seems to have caught the eye more than, say the tenth or the twentieth. It’s hard to escape the fact that football disasters are more firmly in the national consciousness after the heavy coverage that the Hillsborough deliberations received. The Bradford Fire and Hillsborough were, of course, entirely different events and this is the sort of ‘commemoration’ that most of us certainly won’t want. But we have to expect some element of this. Equally, there will be those who try to bill the event as the ‘forgotten disaster’ just because they’ve not seen fit to mention it themselves before. We won’t, and never have, forgotten the 56 in Bradford. 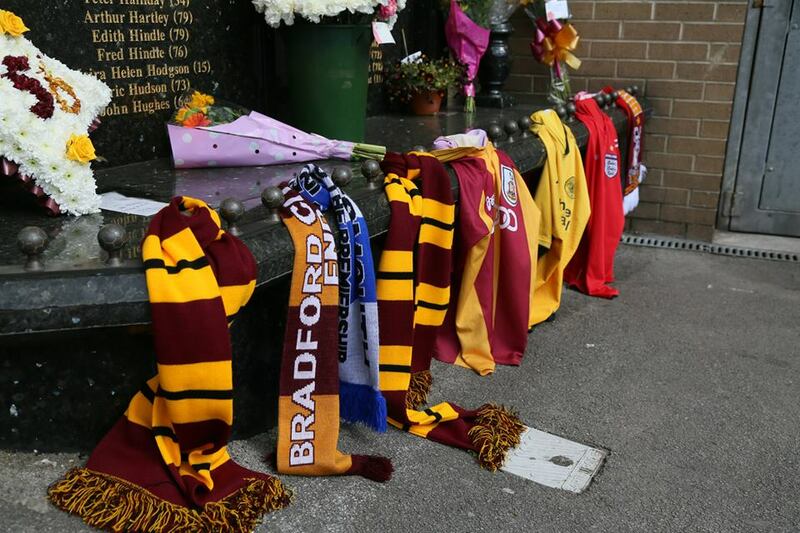 To me, the Bradford Fire is just that – a disaster that hit the city of Bradford as a whole (not forgetting those from outside the city who also suffered) and not solely the club or even its supporters. I think it’s telling that the event is less often referred to as the Bradford City Fire, and I would never object to commemorations taking place away from the ground. Within the ground, if people want to mark the occasion with applause, I’d understand their motivations and share their desire to show respect for the 56. But it’s not something I’m entirely comfortable with. In the past I’ve found myself taking pride in the fact that my club might observe a silence more respectfully than another – and I don’t especially like myself for this. It’s a small step from here to introducing a sense of rivalry in commemorating disasters which would obviously be inappropriate. I think that you can add to this the argument that the more we do to show how much we care – within the context of the match itself – the more we leave ourselves open to the sick mockery of those who take rivalry onto an entirely different and darker plain. However we, and others, choose to commemorate the Fire it is an inescapable part of Bradford’s history which still touches many of us every day, not just on 11 May each year.